You can use screws and a drill instead of the framing nailer, but it was super nice to have. We borrowed one from a friend to use so it didn’t cost us anything either. We bought all our lumber and supplies at the Home Depot. It was so easy to order online and have everything ready so we just had to show up and load up the truck. It took us 1 1/2 gallons to paint 2 coats on the patio pergola. 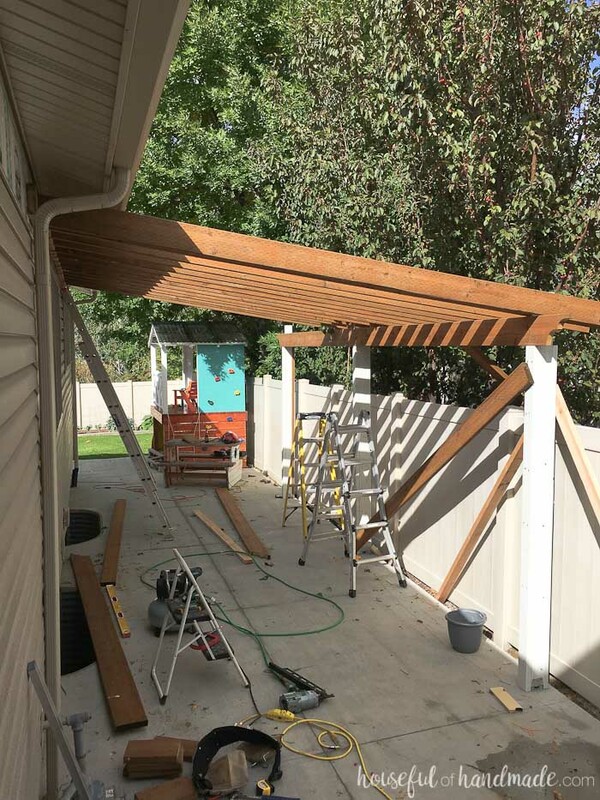 We knew we were going to adding a pergola to our patio before we had the concrete poured. To give our pergola footings a strong grip, the concrete guys dug out where the posts were going to be so the concrete was deeper in those areas. Then when we installed the post bases, the bolts used to hold them wouldn’t be longer than the cement was deep for a nice strong hold. This step is not necessary, but if you can, it doesn’t hurt. 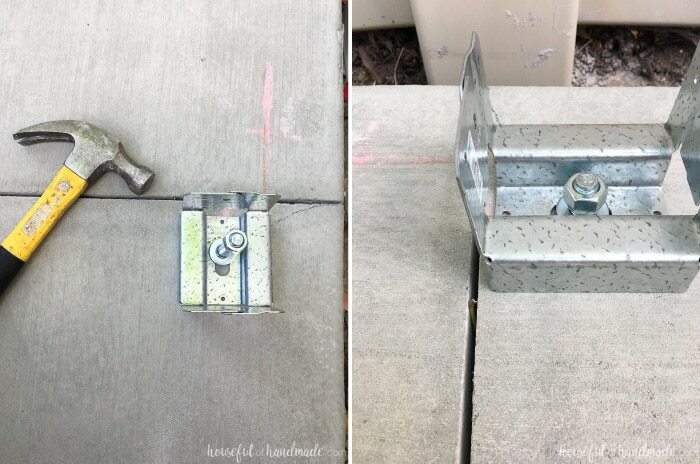 To install the post bases, we drilled a 1/2″ hole in the concrete with a 6″ masonry bit. The hole was about 4 1/2″ deep. Then we placed the base over the top and using a hammer, tapped in the wedge anchor. Then tightened it down with a wrench. Now we were ready for posts. I thought it would be easier to paint all the boards for the pergola before we built it, then I could just add the final coat once it was built. Well, because of the rain, I only managed to get a few boards painted. So you will notice some boards are white, but most are not. No worries, we remedied that when the sun finally decided to shine again. We attached the 4×4 posts to the post base. Then cut 2×4 boards to flank either side of the posts. These are for a bit more stabilization and to support the weight of the 2×8 beams to make installing them easier. Before cutting the 2×4 post boards, we made sure the tops were level (most patios are not perfectly level). We used a level and a chalk line to get a level line at the top, then cut the boards to that length. A laser level would also work, but I don’t have one of those yet. 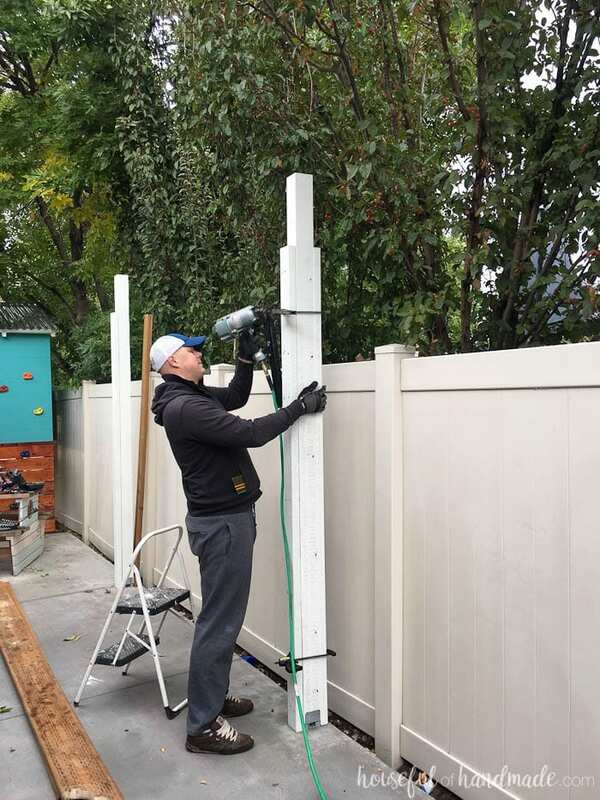 We attached the 2x4s to the 4×4 posts, while ensuring the posts were plumb with a 4′ level. We used a couple boards to help hold the first posts plumb as we worked (once the first one was plumb and secure the rest were easy to keep in line). Then we installed the 2×8 beam above them. But first, I cut a decorative edge to it with a jig saw (totally optional but makes everything so much prettier I think). These were secured with framing nails. We cut the beam so it broke over the center post. 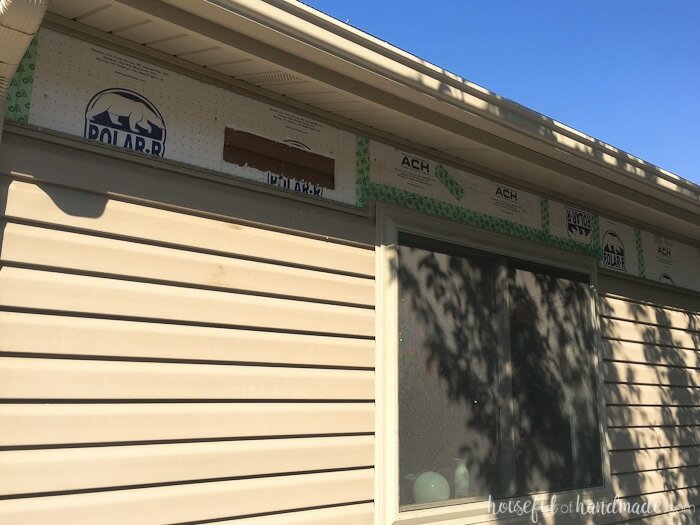 The first challenge we had was the siding. 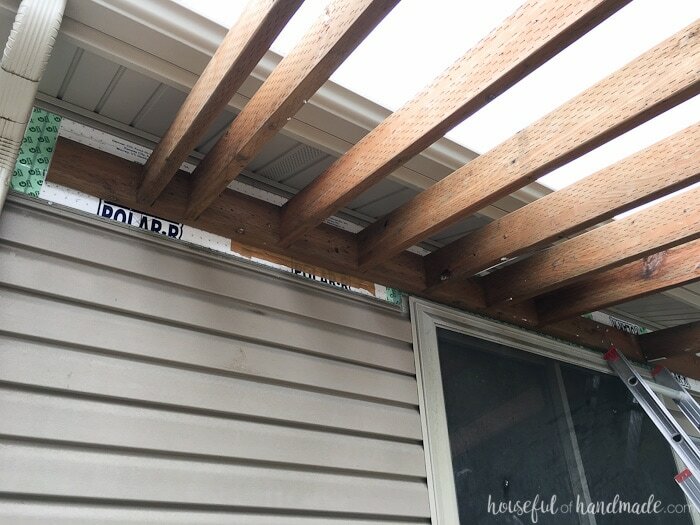 Our house is covered in vinyl siding, which has to be removed so the pergola header can be securely fastened to the house. I thought removing siding would be hard, I was wrong. It is created so that it just clicks into itself. With a hammer and a flat head screwdriver for leverage, you can pop the vinyl siding off the house. Now, getting the siding back on may prove to be a challenge too. I’ll be sure to share that too. We secured the 2×6 header to the house with 1/2″ lag screws. Making sure the header was attached to the studs. Our siding was laid over the wood paneling that was existing on the house so we had to find the studs under the paneling. We removed a small section of the insulation to verify that we were indeed in a stud and measured from there, confirming that we had studs and not just paneling as we went. Predrill the holes for the bolts. Use 2 for each stud (typically every 16″ on center). We built our header long so we could square up the posts and then cut off the excess. 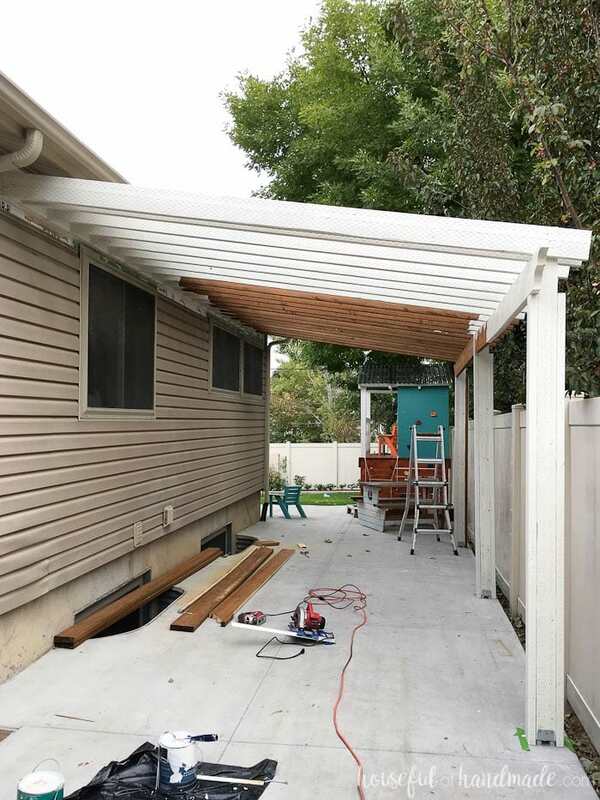 Once the header was attached, it was time to add the pergola cross beams. Which is where the next challenge came into play. 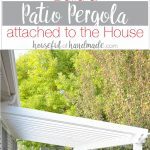 Since we are planning on covering our patio pergola so we can enjoy it more, we have to be concerned with things like snow load and roof pitch. If we were leaving the pergola open, it would not have been an issue. So we consulted the experts and determined that we needed to make our cross beams 12″ on center instead of 16″ and we used blocking between the beams at the header. The blocking also eliminated the need for hangers, bonus! All our cross beams needed to be cut an an angle to give us the slope from the header to the outside of the patio pergola. 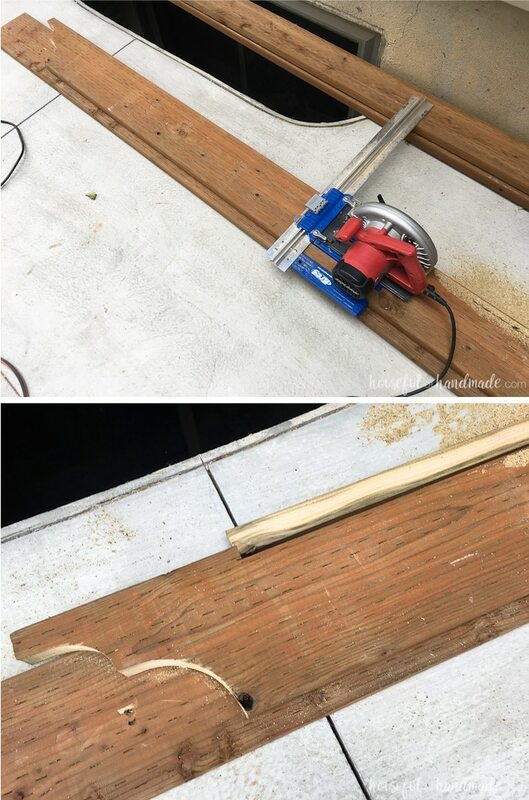 Instead of hauling all the boards into the garage to use my miter saw, I used a carpenter’s square and a circular saw to cut the boards. To draw the angle needed on the boards, you can angle the square so the board lines up to the degree mark on the side and draw a line. Super quick and easy! Then cut along this line with the saw and you are ready to install the cross beams. Before attaching the first cross beam though, we needed to ensure it was square, This turned out to be a challenge too. We tried using a framing square, a string, and so much more. 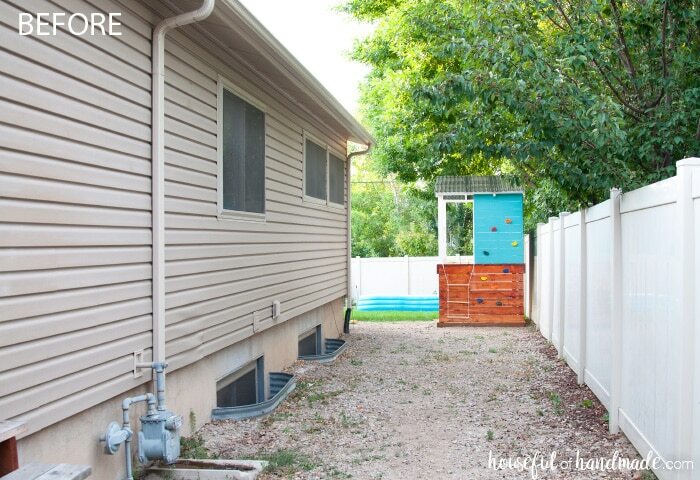 But what was it that finally helped us get a square pergola? The 6, 8, 10 rule. If you remember back to your geometry days, a right angle triangle with 6″ on one side and 8″ on the other, will have a third side that is 10″. 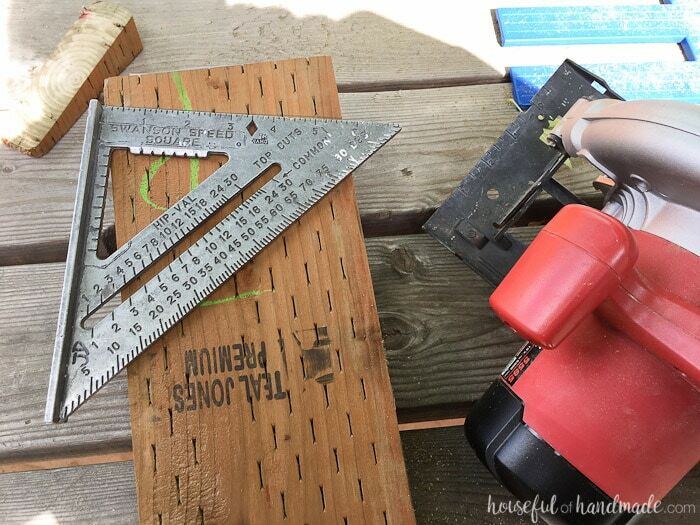 We used this method to determine our pergola was a 90 degree angle by measuring 6′ down one side (on the header beam), then 8′ down the first cross beam, then if you measure between these two marks, they should be 10′. We adjusted the angle of our crossbeam until it was 10′ and presto, 90 degree angle! Now that one side was 90 degrees, we could work off that to the other side. So we secured the cross beam to the header by toe nailing nails in with a framing nailer. 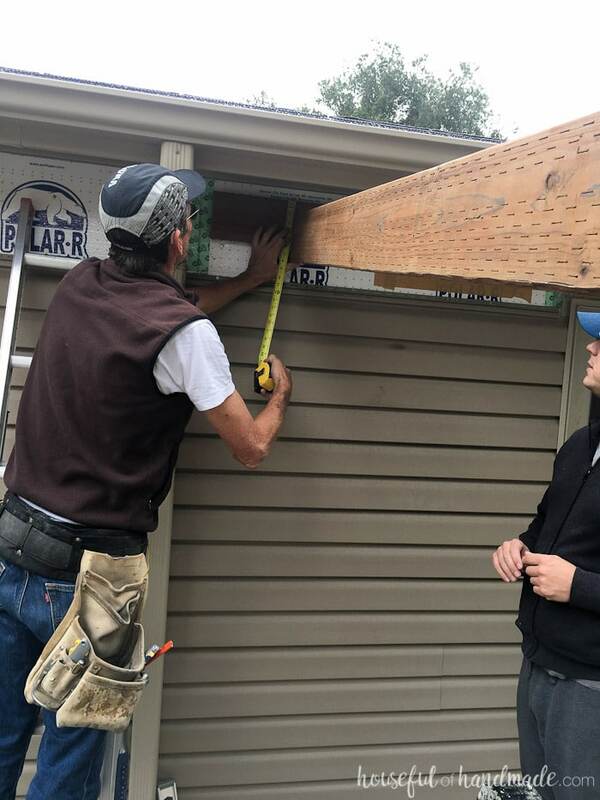 Then we attached a 3 1/2″ block (the width of the 2×4 post it would be attached to on the other side of the pergola) of 2×6 to the header right next to the cross beam. This was attached to the header and the cross beam. Then the second cross beam was attached to the side of the block and toe nailed into the header. Again we used our framing nailer to make quick work of this. Before getting crazy attaching cross beams all the way down, we took a minute to attach these first to cross beams to the posts and beam on the other side of the pergola. 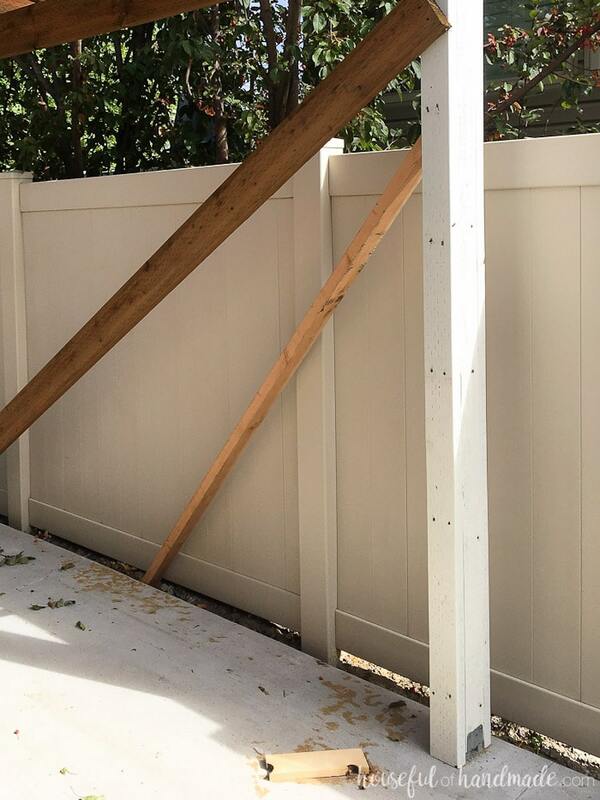 We double checked that the posts were plumb both ways before attaching the boards. Now it was a matter of attaching cross beams all the way down with 10 1/2″ blocks of 2×6 between them to keep the beams 12″ on center. Because we had 3 hands, I was in charge of cutting the angle on the top of the cross beams and the blocking. 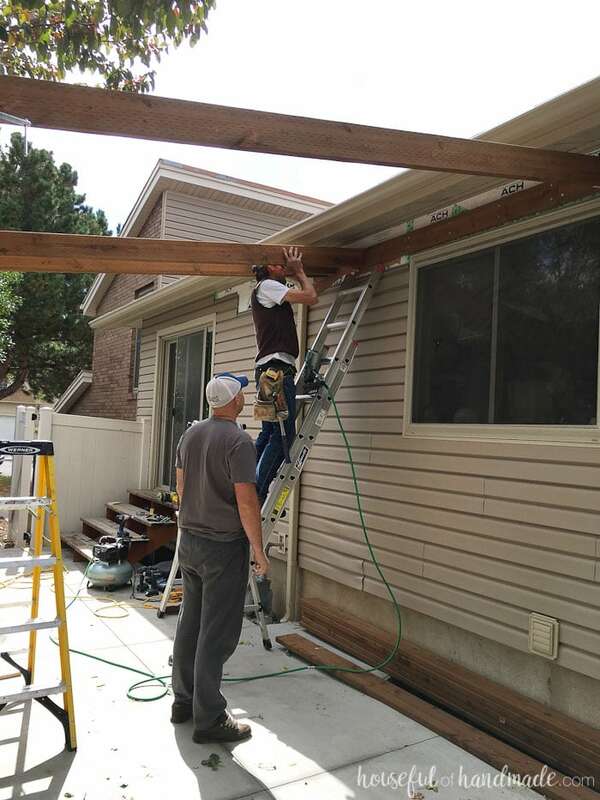 My husband was in charge of lifting the heavy boards up over the beams, and my father-in-law nailed them in. It was crazy how fast this went once all the checking and double checking was done! We did have to take a break and double check plumb again when we moved past the center post. This helped us ensure the back post was all plumb too. Then we went to work and finished things up quickly! Once all the cross beams were attached to the header, we needed to attach the cross beams to the beams above the posts. Making sure the cross beams were 12″ on center over the beam, we attached them by toe nailing with the framing nailer on either side of each beam. We needed to clean up the back of the cross beams so they were all straight at the end of the pergola. We pulled a chalk line over the top of the cross beams at the length we wanted them past the posts. Then used the square to draw a line to cut. 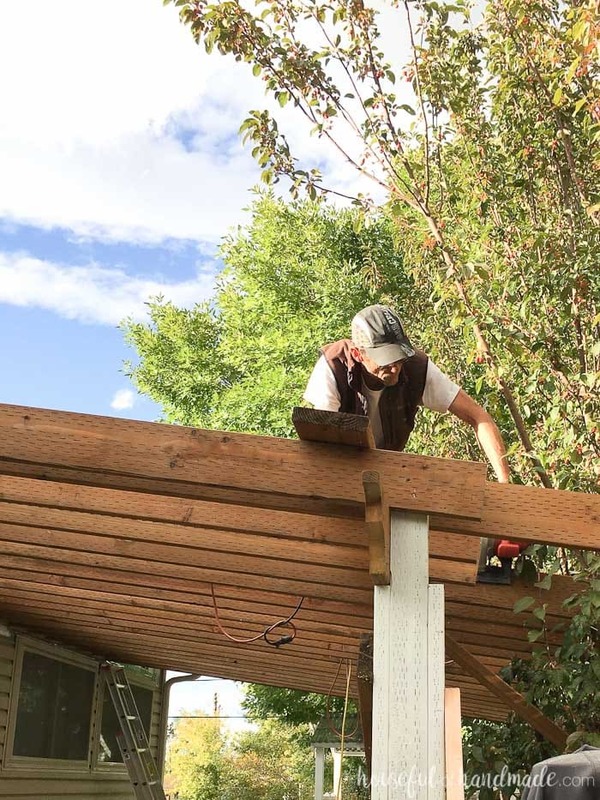 My father-in-law climbed on top of the pergola and quickly cut all the ends off the cross beams. Lastly, we needed to add the second beam on the backside of the posts. Because the cross beams were at an angle, we needed to cut off the top of these beams. I didn’t want the decorated sides to be affected so I cut a notch on the top of this 2×8 beam just were the cross beams would lay but left the 12″ overhang on the edge of the beam the full height. We had to bang these beams into place, but it gave us a nice tight fit. The cross beams are now supported over two beams between the posts. Then we toe nailed the cross beams to the second beam too. If I did it again, I would remember to add the second beam before adding all the cross beams, but hindsight is always 20/20 right? Then my husband and I set to painting the patio pergola. It took us about 6 hours to paint 2 coats of Behr Ultra Plus in Sentimental Beige over the entire thing. But I love that the pergola now matches the house and fence. It looks like it has always been a part of it! I still need to add a bit more blocking before adding our pergola roof. Just to give it even more stability in case of a crazy snow storm. But for now I am ready to just enjoy our hard work. Unfortunately I don’t get to just enjoy it for long because winter will be here before we know it. Have you ever taken on a big project like this? It is totally worth it! 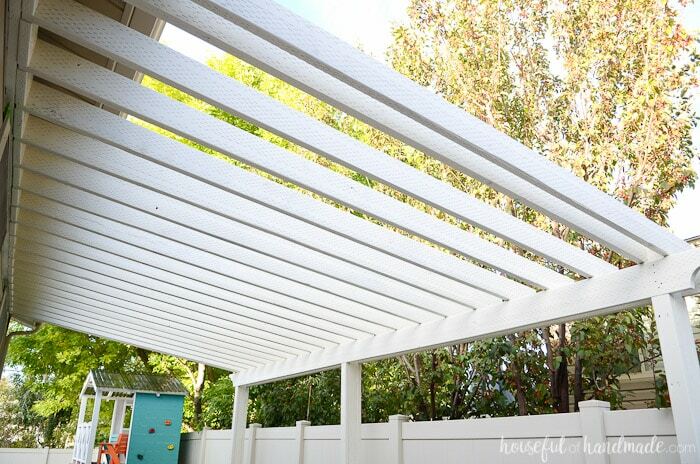 And if you have good weather, this DIY pergola could easily be built in a weekend. Butter family will be able to enjoy it every day now. And make sure to check out the rest of our DIY remodel projects for budget friendly remodeling ideas.